Tom Hanks (b. 1956) is an American actor known for his “everyman” roles in popular films since the 1980s. 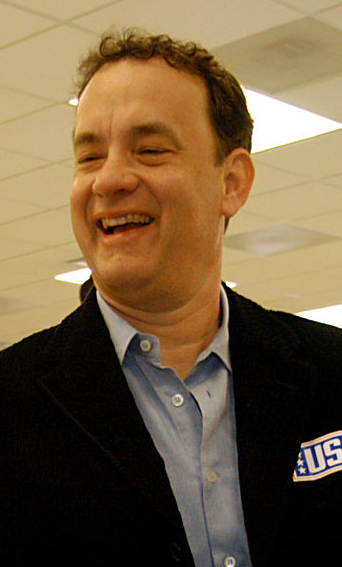 After a string of leads in successful comedies, including Splash (1984) and Big (1988), Hanks shifted his career focus to character-driven dramas. He received his first Academy Award for his portrayal of Andy Beckett in Philadelphia. Denzel Washington (b. 1954) is an American actor with several award-winning performances and starring roles in box office hits. Washington starred in television drama St. Elsewhere from 1982 to 1988 and received an Academy Award for his role in Glory, a 1989 Civil War film. He is pictured here at the 1990 Oscar ceremony. 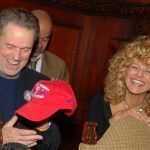 Jonathan Demme (1944–2017), pictured at left in this 2008 photograph, was an American director, screenwriter, and producer. Demme directed several comedy and drama films throughout the 1970s and 1980s, ultimately receiving an Academy Award for his work on The Silence of the Lambs (1991). He filmed several movies in the Philadelphia area, including Philadelphia, Beloved (1998), and Neil Young Trunk Show (2009). Philadelphia’s cast and crew came to the titular city for much of the film’s production cycle. The early 1990s skyline appears prominently in an opening sequence, and establishing shots feature several Philadelphia landmarks. The Mellon Bank Building (now BNY Mellon Center) represented the headquarters of protagonist Andy Beckett’s law firm. City Hall, shown here in a 2005 photograph, is the site of the film’s climactic court case. Additional filming locations included 1218 Arch Street (now the Center for Architecture) for the movie’s Action AIDS Center and 1901 Chestnut Street for Joe Miller’s office. As a form of cinematic activism, Philadelphia (1993) attempted to reform the public understanding of AIDS in a time when ignorance and fear of the disease fueled prejudice and hate. The film is not merely set in the city of its title, but in a large part, the people of Philadelphia performed it. Extras who stood in the background of its street-side scenes, observers of the court proceedings, and people in the hospital receiving treatment were Philadelphians fighting the AIDS epidemic themselves. In the early 1980s, Philadelphia, along with New York and Los Angeles, saw the first diagnoses of illnesses later understood to be the AIDS virus. Because of this historical relevance, Sharon Pinkenson (b. 1948) of the Greater Philadelphia Film Office suggested to Jonathan Demme (1944-2017), the film’s director, that he set his production in Philadelphia as a tribute to the people affected by the disease. Originally, Demme was in search of another major city for his film. However, after spending time in Philadelphia and realizing it to be a symbol of independence, exuding at times a culture of tolerance and brotherhood, Demme found it an ideal location to host a story about discrimination and prejudice. In the film, Tom Hanks (b. 1956) plays the role of Andy Beckett, who contracts AIDS while simultaneously ascending the ranks of a prestigious Philadelphia law firm. Andy is a passionate, knowledgeable, and dedicated lawyer, who in the beginning of the film wins an argument before a judge over the environmental toxicity of building materials used by a company that his firm represents. Despite his initial success, Andy is dismissed from the firm after his colleagues discover that he is infected with AIDS. The plot develops around Andy’s wrongful termination and his exposure of the firm’s true motives for firing him. Andy eventually gains the sympathy of an African American lawyer, Joe Miller, played by Denzel Washington (b. 1954), who decides to represent Andy after identifying with the prejudice he faces as a victim of AIDS. A number of legal and social initiatives at the time of the filming and release of Philadelphia similarly advocated for those affected by the illness. The federal Americans with Disabilities Act, passed in 1990, prohibited termination of an employee solely because of an illness, including AIDS, or other circumstance brought upon them involuntarily. The AIDS Law Project of Pennsylvania, a nonprofit law firm founded in 1988, specialized in assisting AIDS victims by taking on cases such as workplace discrimination, harassment, and estate settlements. These initiatives sought to challenge employers who asserted probable cause when dismissing a queer or infected individual from a job. As in Andy’s case in the film, victims argued that the illness did not inhibit them from performing their work duties and therefore should not be a basis for firing or otherwise quarantining them from society. While vested in social issues confronting Philadelphia and beyond, the film also documents a panorama of locations across the city in the early 1990s. Its opening scene and many interludes feature views of the skyline, including buildings such as One Liberty Place and City Hall. In one instance, the film shows the charred remains of One Meridian Plaza, the high-rise on Fifteenth Street across from City Hall that was condemned after a 1991 fire that took the lives of three firefighters. On Market Street, the Mellon Bank Building played the role of headquarters of Beckett’s prestigious law firm, and a building at Nineteenth and Chestnut Streets served as the law office of Joe Miller, the lawyer who represents Andy in his wrongful dismissal suit. The climax of the film takes place in and around City Hall, which served as the site of the court case that is the pivotal moment in Andy’s story. Philadelphia earned two Academy Awards, one for Hanks as best actor and the other for best original song, “The Streets of Philadelphia,” by Bruce Springsteen. While garnering critical praise and popularity, the film received mixed responses from the gay community. Some questioned Demme’s knowledge of gay sexuality in his representation of the relationship between Andy and Miquel, played by Antonio Banderas (b. 1960). Others, however, praised the production for its advocacy of an issue towards which the rest of society was dismally silent. Philadelphia prevailed at a time when AIDS was both widespread and grossly misunderstood, and by penetrating the social ignorance towards the disease the film taught people to empathize with affected individuals instead of shun them for their malady. Goldfein, Ronda B., and Sarah R. Schalman-Bergen. “From the Streets of Philadelphia: The Aids Law Project of Pennsylvania’s How-to Primer on Mitigating Health Disparities.” Aids Law Project of Pennsylvania. Gonzalez, Carlos, B. “The Film Philadelphia as a Case Study of Ethical Dilemmas in the Workplace.” Journal of Business Case Studies, vol. 4, no. 7 (2008): 41-6. Gordon, Elana. 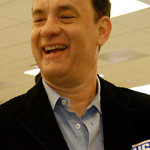 “Two Decades Ago, Tom Hanks and ‘Philadelphia’ Prompted Changing Attitudes Toward HIV-AIDS,” WHYY, 20 December 2013. Senak, Mark S. HIV, AIDS, and the Law. Ann Arbor, Mich.: University of Michigan Press, Insight Books, 1996. 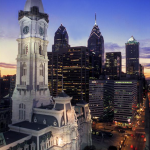 City Hall, Philadelphia, 1401 John F. Kennedy Boulevard, Philadelphia. One Liberty Place, 1650 Market Street, Philadelphia. Market Street, Chestnut Street, and South Street, Philadelphia. This is such a well rounded article. Not only does it fill me in on the exact nature of the plot but it provides so much information to contextualize the movie and situate it both historically and geographically. 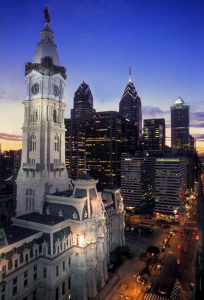 As a native to the Philadelphia area I can certainly attest to the fact that our city itself serves as a symbol for freedom and the ongoing struggle for freedom of all peoples. Prior to reading this article I had absolutely no idea that the AIDS Law Project of Pennsylvania existed in 1988, a time when so much our society was under the wrongful impression that the virus could be spread through the air etc. All in all this was a really insightful read filled with pertinent information, I enjoyed it a lot!